While surfing the Internet, We usually need to sign up for many web services.Sometimes we also need to sign up in order to use full resources of websites,that is ,some websites need you to sign up for accessing their resources. For this you need to provide your email address.But if you provide your email address so many times your mailbox starts receiving junk mails.In this post i will provide you address of an website which can be used for email verification. 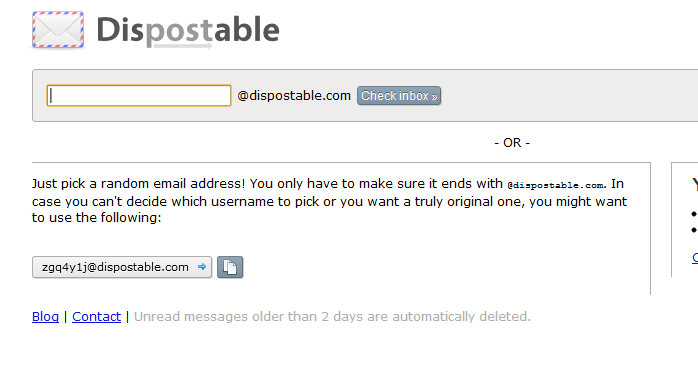 This site is dispostable.com . When you required to sign up on a website, provide this email address and you will receive confirmation mail in this inbox.So you do not need to provide your original email address again and again. This email service does not require any information like your name,address,contact number etc to create a new account. Wow. This one is really helpful. Now I can get rid of my junk emails.